In memory of Barb Keogh…turtle whisperer and project supporter..
We were so lucky this season to have all 38 of our leatherback turtles adopted and named by supporters of the project! One of those turtles, Lucy McGillicuddy, was adopted by Penny Mabie for her partner, Barb Keogh. We were really sorry to learn that Barb recently passed away. As a lovely tribute to Barb and in support of Penny, friends and colleagues have made a generous donation to the project in memory of Barb. 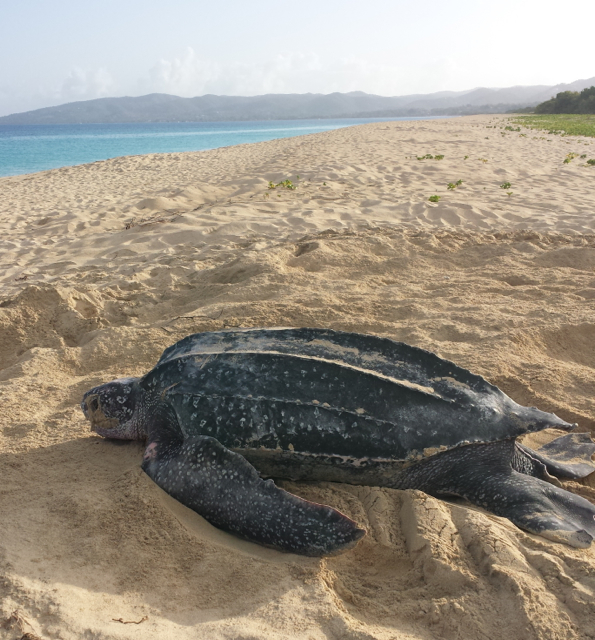 We will use this donation next nesting season to name a turtle Barb – and to equip her with a satellite tag so we can follow her movements throughout the northern Caribbean. Barb will be part of a larger research initiative to understand how leatherbacks are using beaches throughout the region. We will share all of this with you as we go along. Many many thanks to all of you who contributed to this lovely memorial. We so appreciate the support. Attaching here a little bit about Barb – written by her colleagues and friends at EnviroIssues. 8 July update – hatchlings everywhere!